The Renaissance is a strikingly original and influential collection of essays in which Walker Pater gave memorable expression to an aesthetic view of life. It has never before been published in a scholarly edition. 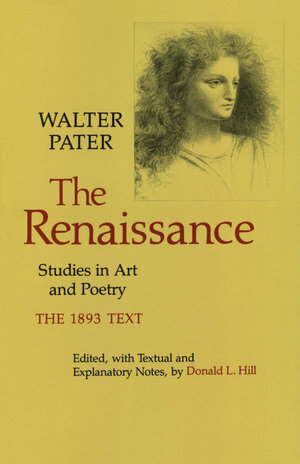 Donald L. Hill reproduces Pater's text of 1893, with a record of all verbal variations in other editions, from the early magazine versions to the Library Edition of 1910. Mr. Hill provides a full set of critical and explanatory notes on each of Pater's essays; headnotes outlining the story of its composition, publication, and reception; and an essay on the history of the book as a whole. Students of Pater and the Aesthetic Movement in England will find this new, annotated edition indispensable. Donald L. Hill is Professor of English at the University of Michigan.